With one spacecraft coming to an end of its mission in March, and another set to launch in 2016, it’s an exciting time for Mercury. 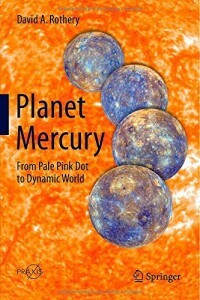 I sat down with David Rothery of the Open University last month to discuss his new book, Planet Mercury: From Pale Pink Dot to Dynamic World for New Books in Astronomy. The innermost planet in our solar system doesn’t get a lot of press compared to places like Mars and Jupiter’s moon Europa, but it’s an incredibly intriguing planet. I’ll always have a soft spot for Mercury because my first project as a graduate student had to do with the orientations of the gigantic lobate scarps distributed across its surface. These vast tectonic features speak to the thermal evolution of a relatively small terrestrial planet that has been cooling over time, and they’re just one interesting aspect of the first rock from the Sun. From a wonky orbital resonance (a day on Mercury lasts two years – weird!) to an unexpected magnetic field, this little planet is full of surprises, and we’re just beginning to untangle them.